Ivan Shishkin, At the edge of the pine forest, 1897. Painted at the end of the artist’s life, “At the Edge of a Pine Forest” was sought after by Tsar Nicholas II for his collection, but ultimately ended up with Shishkin’s nephew. Russian 19th-century landscape artist Ivan Shishkin’s painting At the Edge of a Pine Forest, which Tsar Nicholas II once tried to acquire from the artist, was sold on June 8 at Sotheby’s auction in London for 1.4 million pounds ($2 million), over twice its assessed value, the RIA Novosti news agency reported. The value of the canvas, which was painted a year before Shishkin’s death in 1898, was estimated at 500,000-700,000 pounds pre-auction. 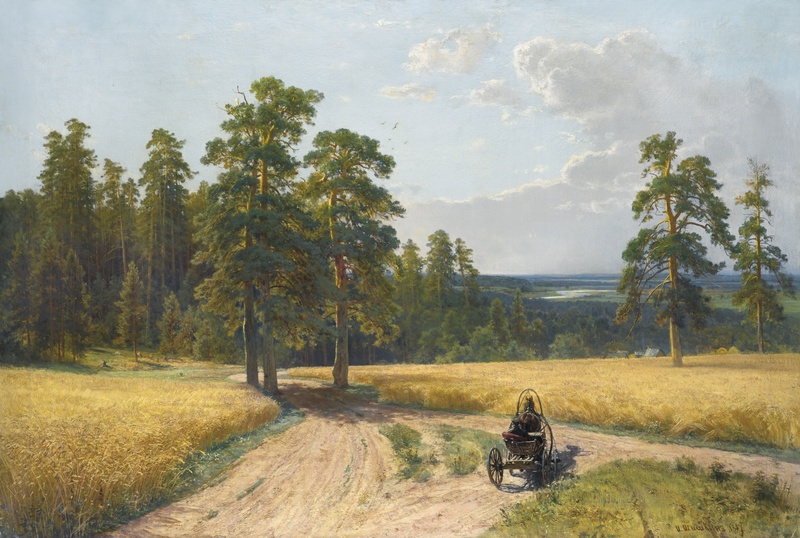 The landscape, featuring endless fields near Yelabuga (modern Tatarstan, Russia), was probably painted from memory after Shishkin’s last trip to his native lands. According to Sotheby’s, the artist’s nephew Nikolai Stakheyev bought the painting, but it is known from their correspondence that the first application on obtaining came from Nicholas II. The tsar desired to buy it for his private collection, “but was refused, and only after that could Stakheyev buy it, to the joy of Shishkin,” explained the Sotheby’s representative. Stakheyev later took the painting abroad, where it ended up in the collection of the Belgian artist Charles Defreyn. Now his descendants have decided to sell it. An abridged version of the article first published in Russian by RIA Novosti.